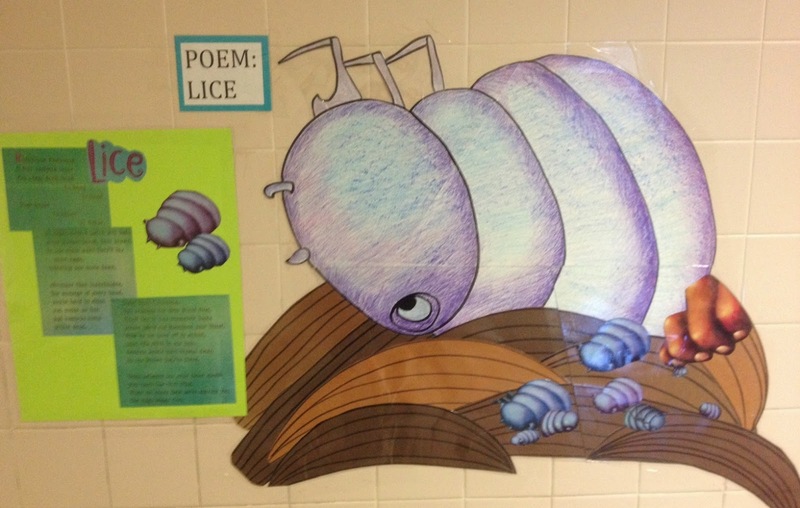 Students - The idea for this poem came from a student at Eggert Elementary School in Orchard Park, NY. I was teaching a writing workshop for upper grade students, and one student drew the nest from my writing pot. On the back of the nest were written the words FABULOUS FACT. This meant that we were all to think of a favorite fact and let this fact inspire a poem or snip of writing. 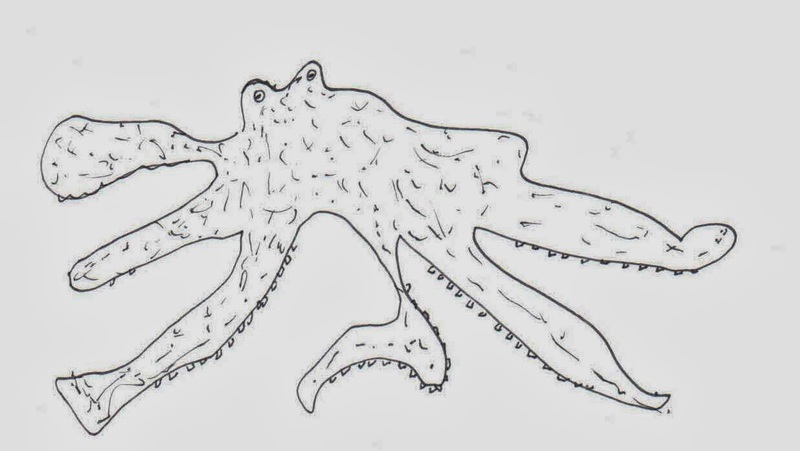 One girl shared the fact that octopuses have three hearts, something I never knew. This fact stuck in my brain, and this morning inspired today's verse to an octopus. 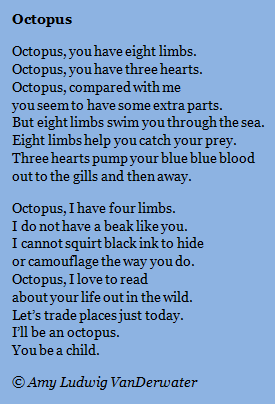 You'll see many facts about octopuses in this poem, and a little twist at the end. It is interesting to write poems of address, or poems that speak TO something. This might be an angle you wish to try with a topic. Instead of writing ABOUT something, speak to it, as if it were right there with you. What would you say? And if you wish for it to answer, simply begin a new stanza and write a conversation poem. On both Wednesday and Thursday of this week, I had the good fortune to visit Eggert Elementary for a big old poetry celebration. Thank you many times over to principal Terry Tryon, the Eggert PTO, to teacher Brian Muffoletto and Tara Zimmerman, to parent Karen Nuwer, to art teacher Wendy Johnson and music teacher Rachelle Francis and to all of the teachers and students for making this a very magical visit. 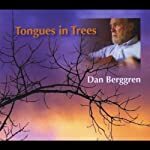 I cannot recommend highly enough the beautiful song, "Birch are Soprano" by Dan Berggren, on his album TONGUES IN TREES. My Wednesday morning began with a sneak listen to the Eggert chorus, who will be performing the first choral version of this song. If FOREST HAS A SONG were a movie, I would hope for this song be the soundtrack. 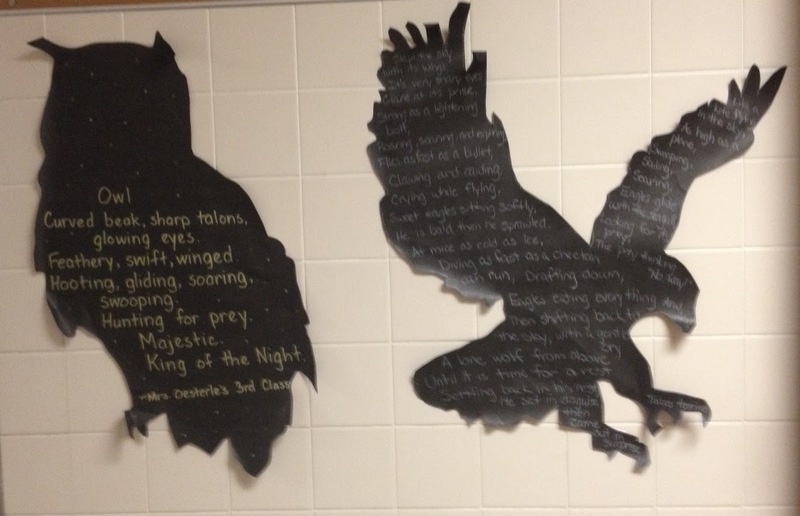 Then, I feasted on expansive and amazing hallway displays of a variety of poems - by children and by me too. Words and artwork everywhere. 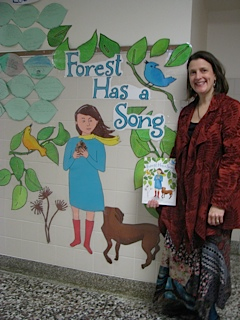 Students wrote poems on leaves, on animal silhouettes, and art teacher Wendy Johnson blew up pictures from FOREST and anthologies with my poems and invited children to make owls, flowers, and other beautiful art. 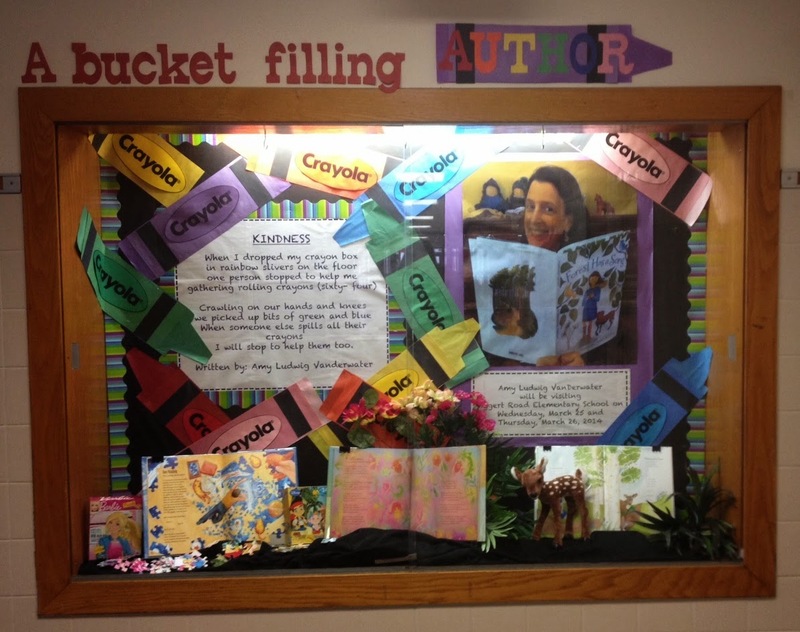 Teacher Brian Muffoletto filled the display case with my poem, "Kindness." 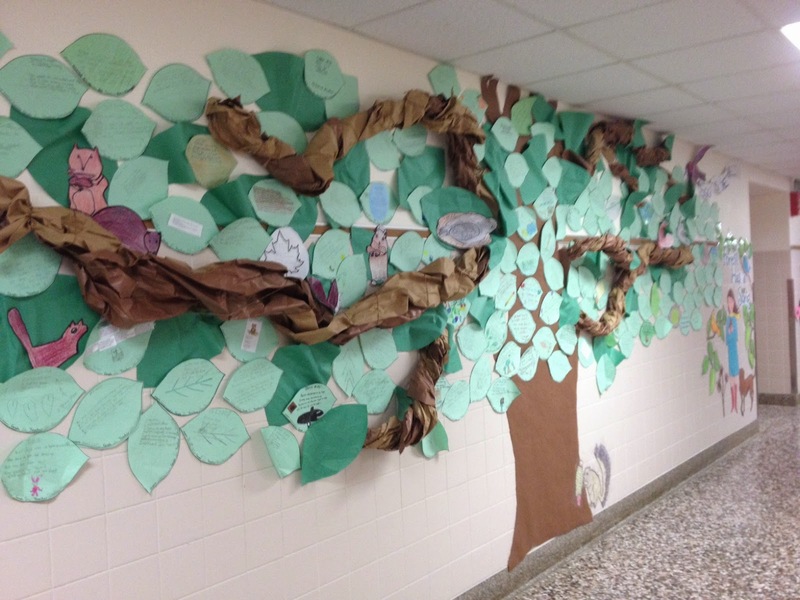 Brian and teacher Tara Zimmerman made this enormous poetree! The nurse and I had our photo taken by this big louse. Wow! 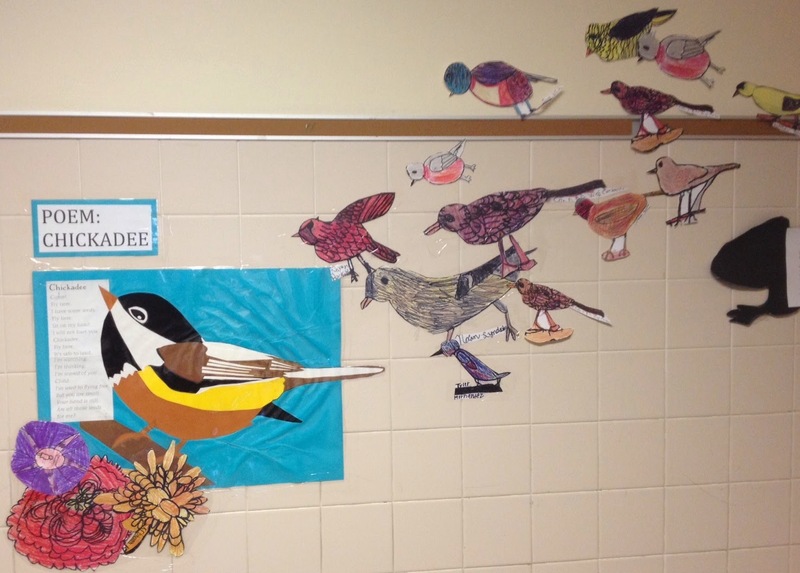 Thank you again to all all all of Eggert Elementary for such a wonderful two day visit. Next Tuesday is April 1, April Fools Day, and the beginning of National Poetry Month. This year I will not be taking a Dictionary Hike (2012) or Drawing Into Poems. Rather, I will write a whole collection of poem drafts, one each day of the month, live, for a new manuscript titled THRIFT STORE. I'll share notes about process, drafts, audio, and pictures. By the of the month, I hope to have a collection worth revising, and I invite you to watch me work. I think I'll call it THRIFT STORE LIVE. If you have not visited Sharing Our Notebooks lately, this week I am so happy to have Mary Poindexter McLaughlin with a story and her notebook-celebrating poem, "The Book." Visit to enjoy this tribute to notebooks, and comment to be entered into the Post-It note giveaway! Next week I will welcome notebook keeper Alex McCarron into this space. Today's Poetry Friday celebration is over at A Year of Reading with Mary Lee Hahn. Visit her wonderful place for all kinds of poetry goodness as we get ready for April, National Poetry Month! Thank you so much for visiting our school! We loved having you and learned so much about beautiful poetry. Beautiful and fun post, Amy! And I can't wait to see you at work with Thrift Store. Happy Friday! Thrift Store is a fun topic for a collection -- looking forward to watching it develop. Looking forward to watching you work in April. I will be writing poems at Deowriter. Interesting poem about the octopus, Amy. I never knew they had 3 hearts either! I also loved your reading rendition! What a beautiful, beautiful welcome you had for this visit, Amy. The art displayed with your 'blown up" Forest Has A Song are is gorgeous. Wish I could have read some of the poems too. I'm sure the students had a marvelous time. Your month sounds exciting-will be reading! Thanks for the fun poem and the amazing school visit! Can't wait for your poetry month project!! Looks like you had a really fun school visit! Love your live Thrift Store project idea. 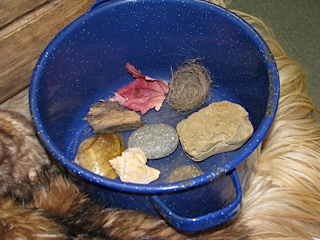 And speaking of great ideas, love your writing pot too! 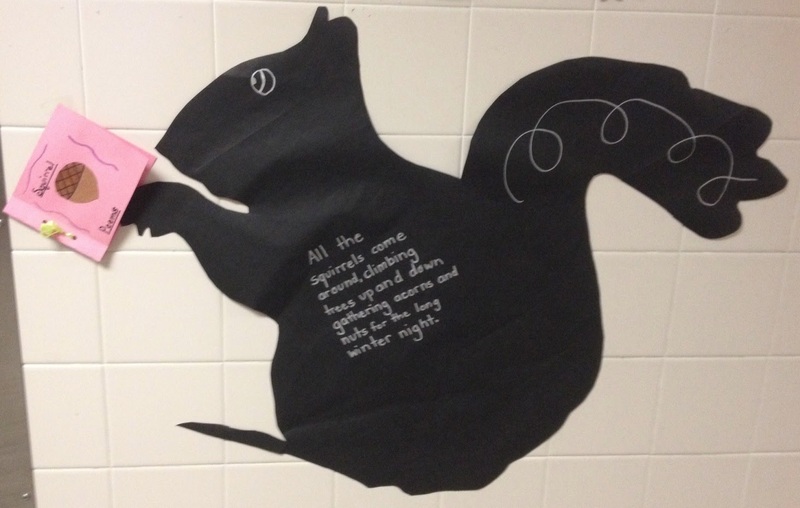 Like Tabatha, i was so impressed with he stunning art in the hallways - your poetry is writ large! How lovely it must have been to visit the school - thanks fro giving us a peek into that day.